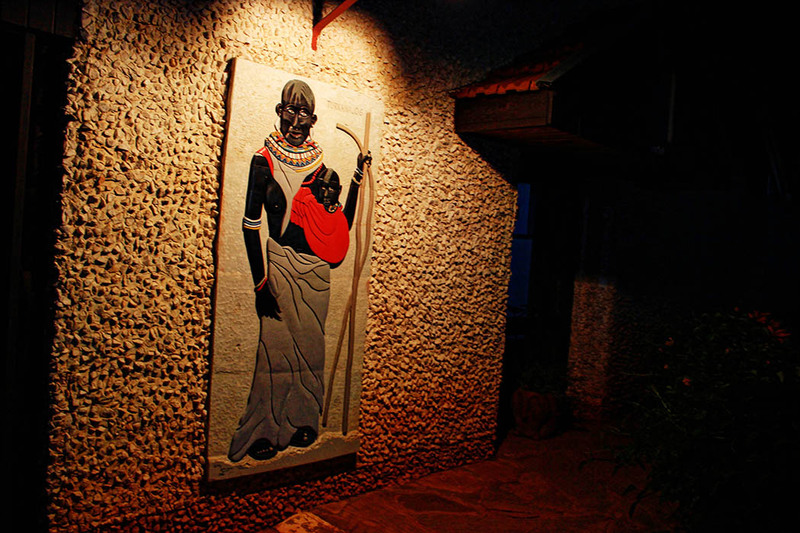 Kerio View was without a doubt the best hotel we spent our night in during the unexpected Kenya journey. 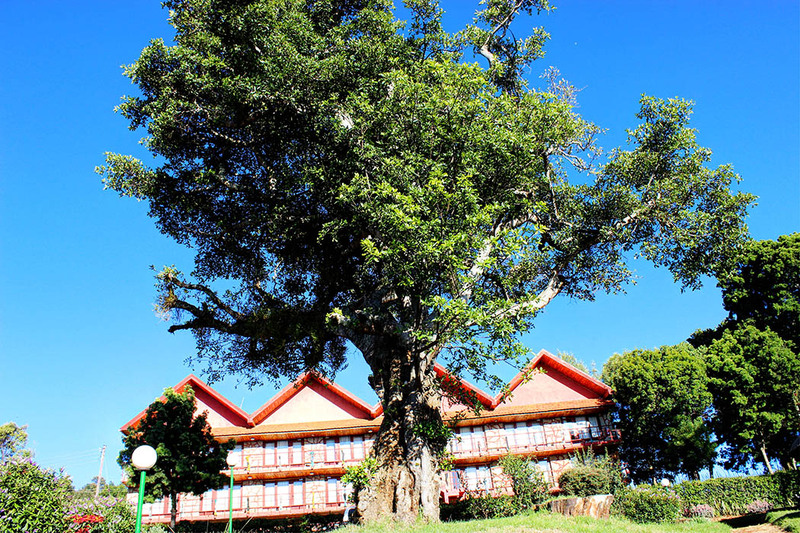 Though I did not get to spend a lot of time at the hotel, in that most of our days were spent on the road, it made enough of an impact for me to want to write about. 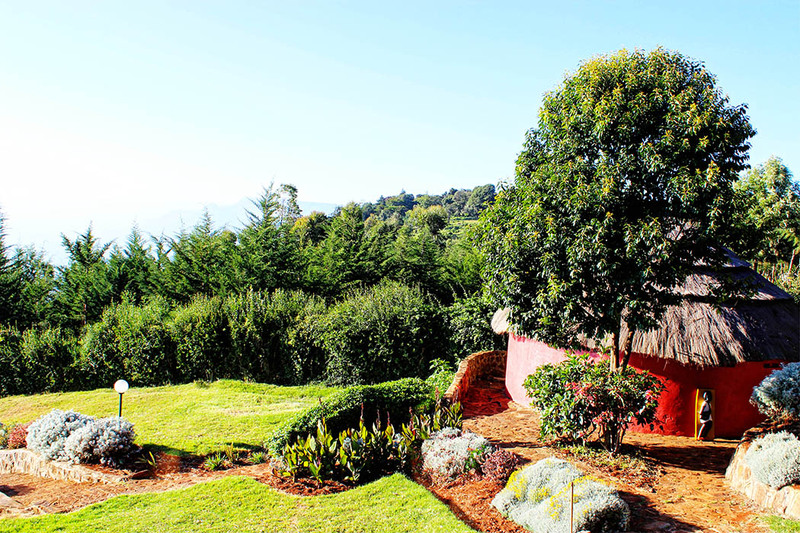 Located near Iten (a town famous for churning out many of Kenya’s world beating long distance athletes), Kerio View Hotel is perched on the edge of the Kerio Valley escarpment with a marvelous view of the Kerio Valley, 1000m below and the Tugen Hills to the east. 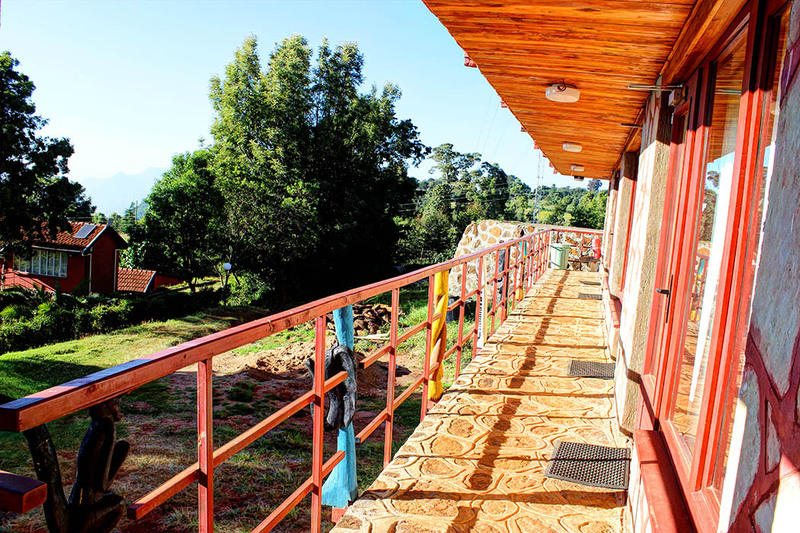 Our stay in Kerio View was very well timed, exactly what I needed given the disaster we had had the previous day. 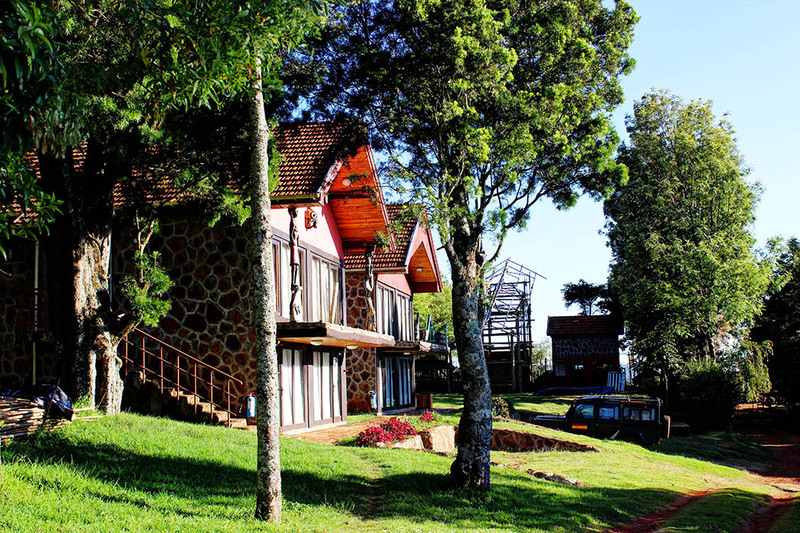 Kerio View Hotel is very rustic. The buildings are low-rise and the finishing is very well done. 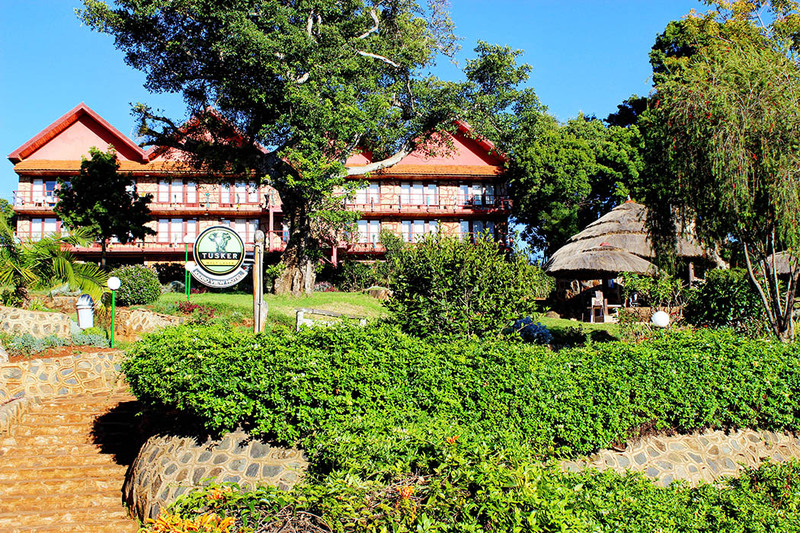 The hotel is constructed on a slope. 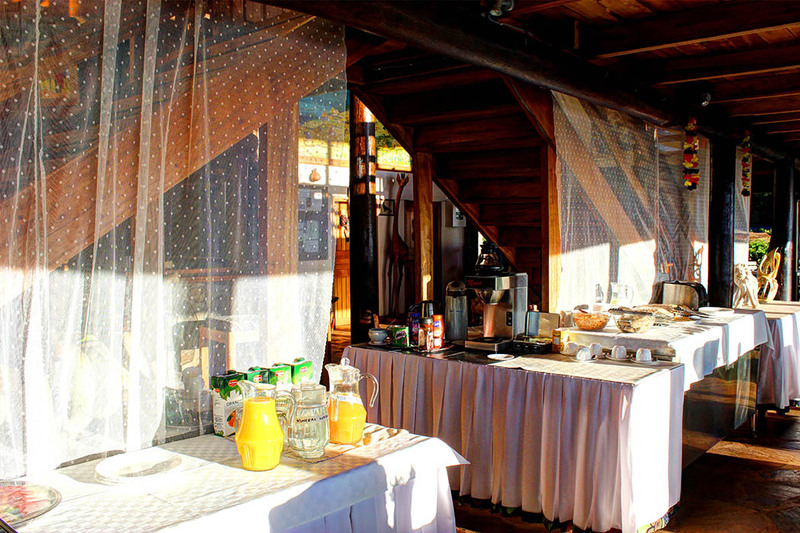 From the rooms, you will walk down along a paved path to the dining area. 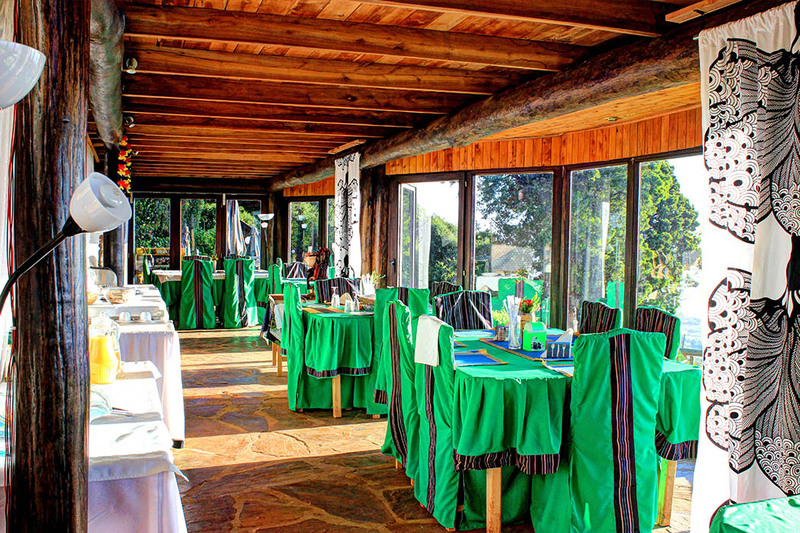 Once you get to the restaurant you will be greeted by one of the most amazing views – a lively panoramic view of the Kerio valley. A recently constructed boardwalk offers even lovelier views. 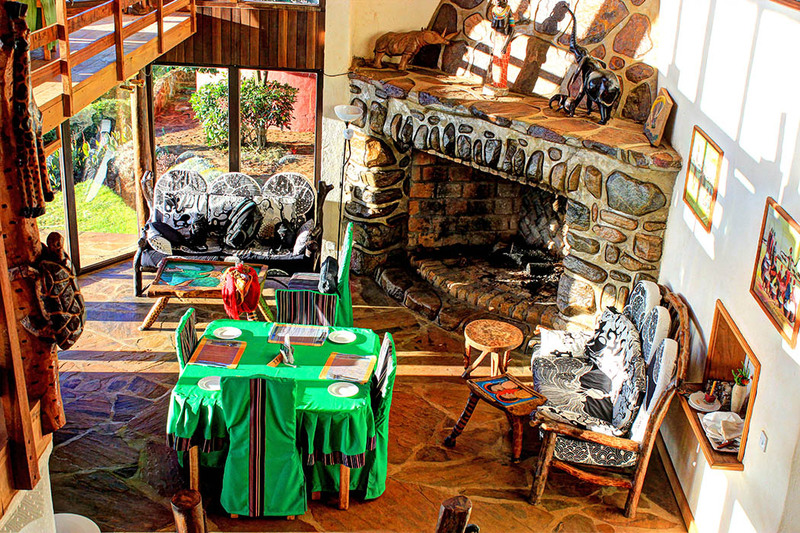 The décor inside the restaurant really brings it to life. There are two levels, the upper level being better because of the view however we spent most of the time downstairs by the fireplace. 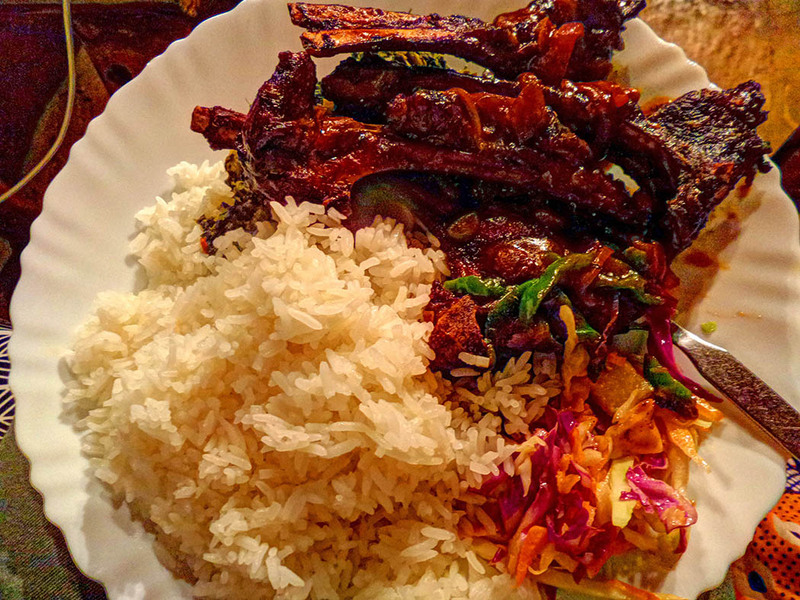 On the first night for dinner I had some mutton ribs, rice , salad and a soup on the side. 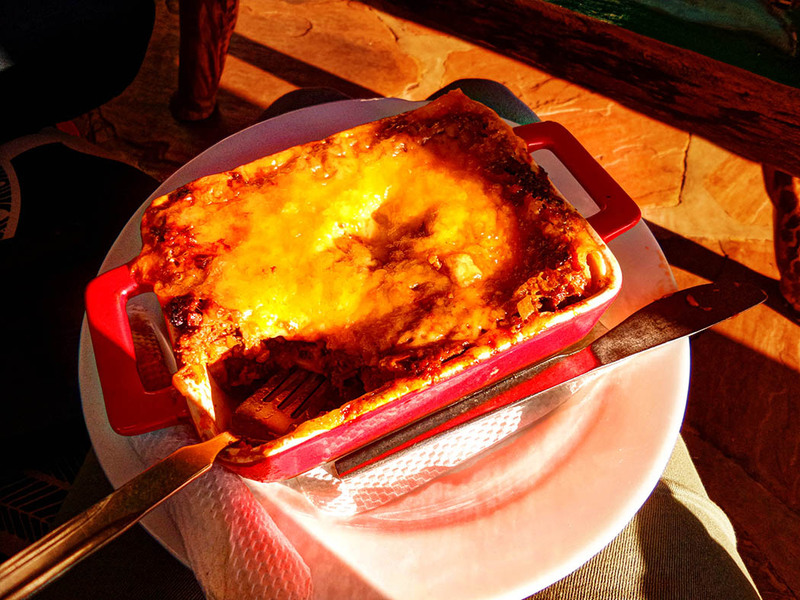 I wanted to have lasagna but it was late and the chef would not have time to prepare it. I did not enjoy the meal very much, the meat was too tough and I gave up on it after a rib or two. I ended up having the rice, salad and soup. I’d like to say that was the last meal I was not happy with but the next day for dinner I ordered lasagna, which ended up being a huge disappointment. It was very bland and I ended up eating only a small portion. What I loved about the menu is that it was very varied. It was a good mix of local meals and international ones. The second day, Chela ordered a salad. Trust me it tasted as good as it looks. 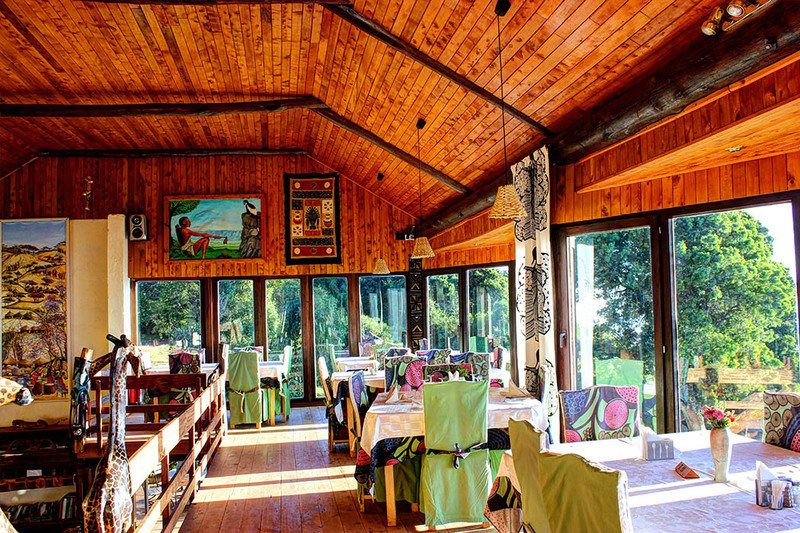 Apart from having to wait for ages for our meals I really have no other complaints about the service and despite the 2 disappointing dinners the other meals were enjoyable. My advice would be to call the restaurant and give them your order an hour or 2 in advance. Every single member of the staff I interacted with had a warm manner and was helpful. The proprietor is a very jolly man. 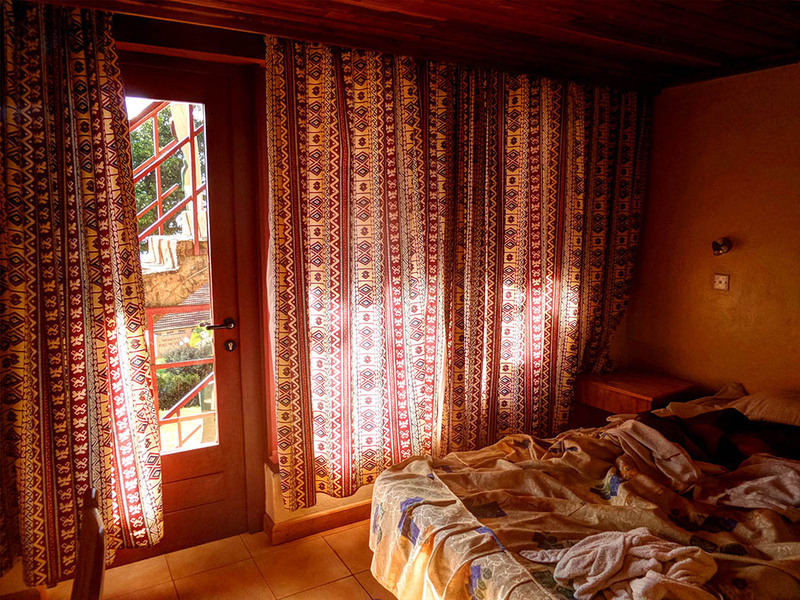 Chela had stayed at the Kerio View before, so once he found out our mission he was quite helpful and provided us several suggestions on great locations to shoot. A lot of thought has been put into the décor in the hotel. 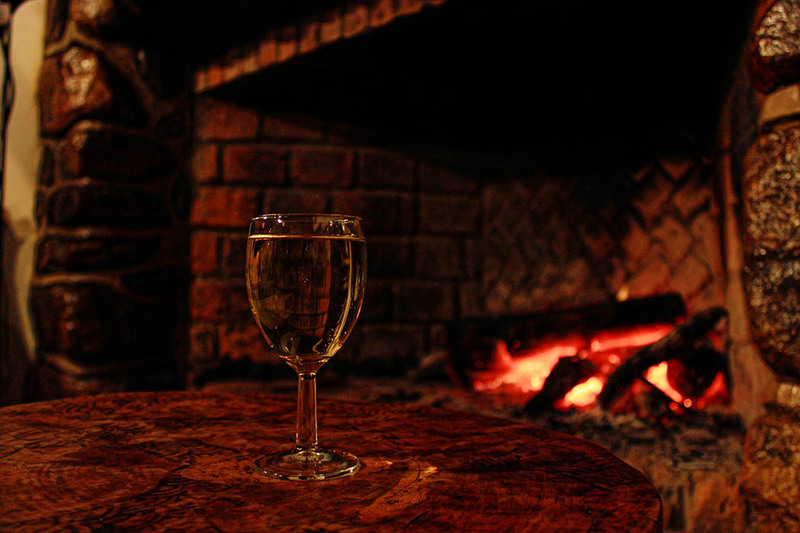 The fireplace was definitely my favorite spot. 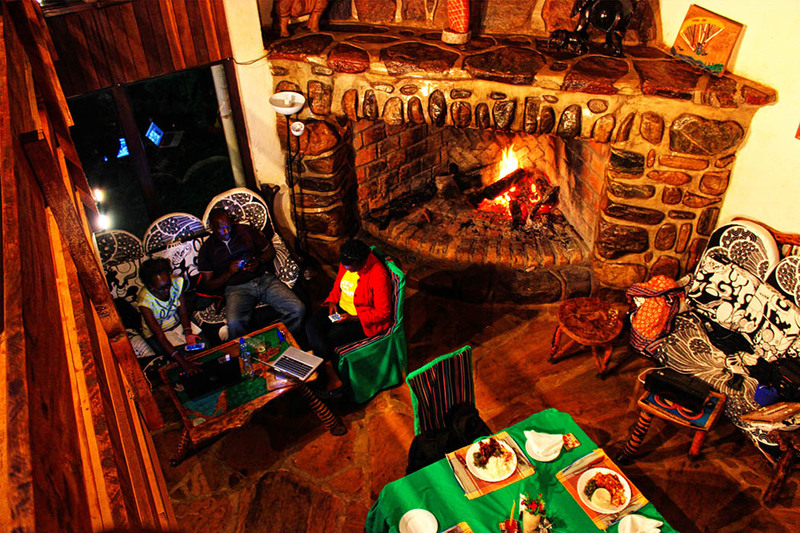 Iten does get very chilly at night and it was the perfect spot to sit while having dinner or working. 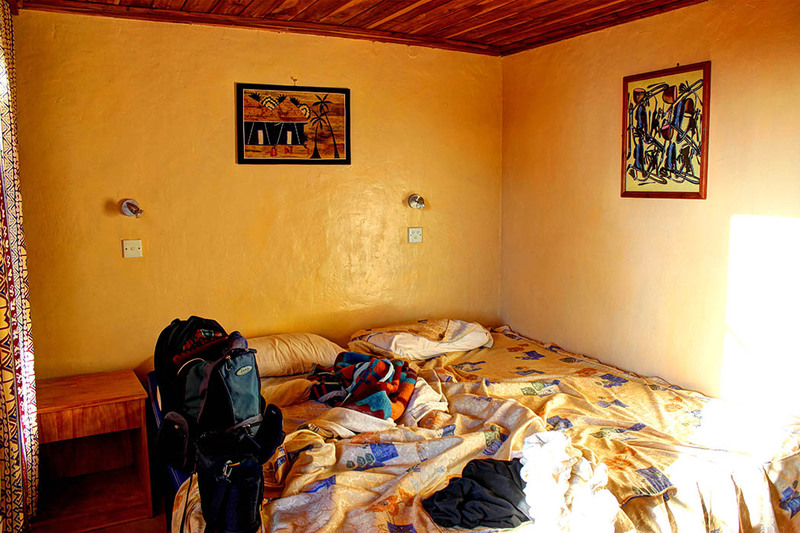 The room I stayed in was plain. I’d describe the décor as clean, fresh and simple. 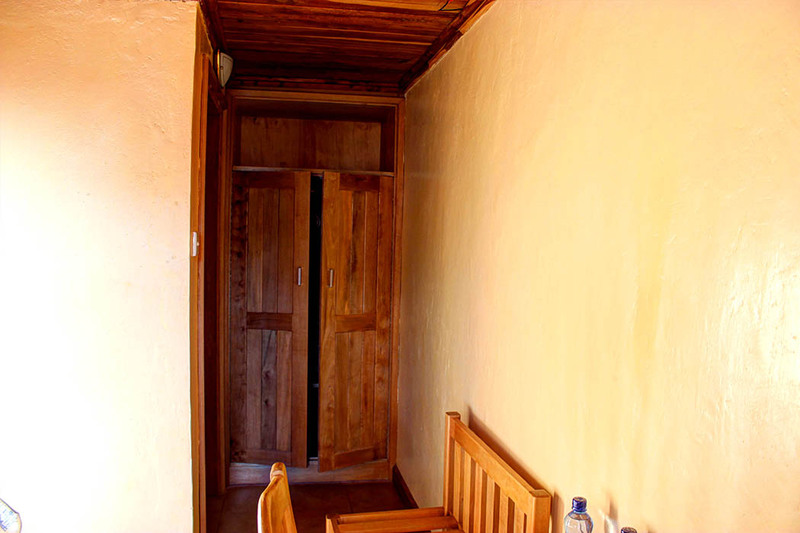 The room contained a desk, chair and a closet. 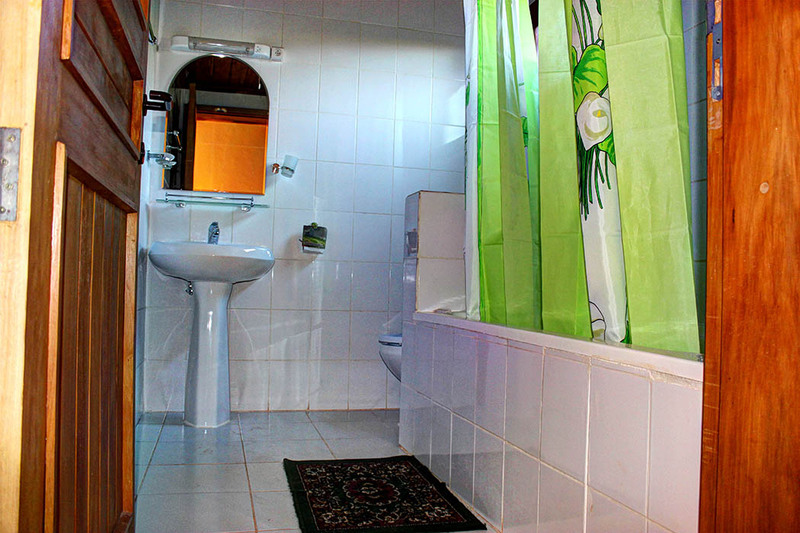 The bathroom contained both a shower and bathtub. My biggest pet peeve about showers is those that only have 2 extremes, scalding hot or freezing cold. 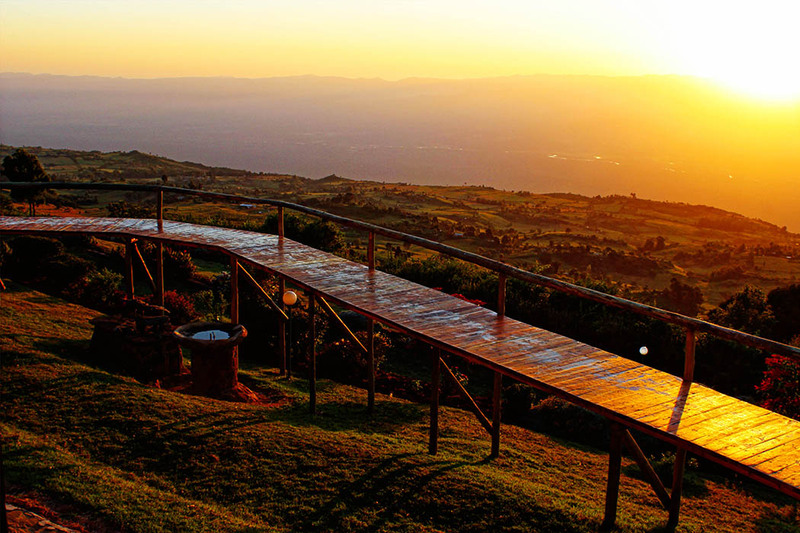 I had no such problems in Kerio view. 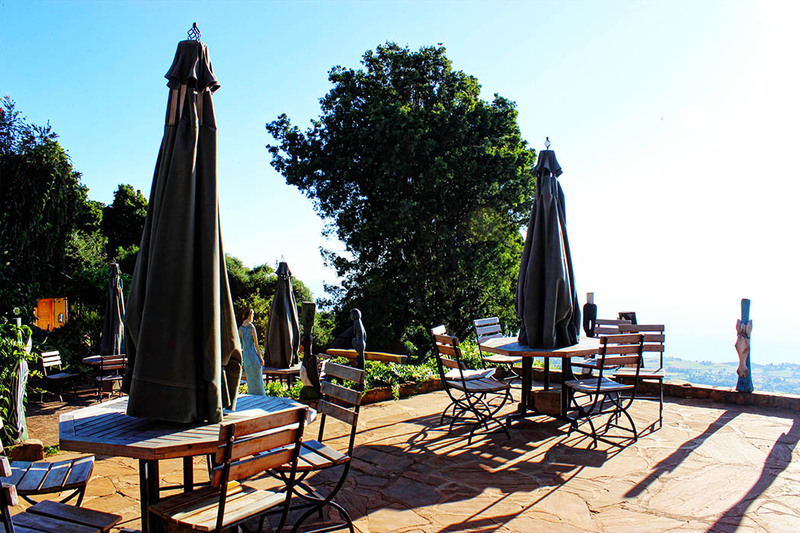 There is free Wi-Fi throughout the hotel which was very convenient as I had to blog every day for the Unexpected Kenya series. 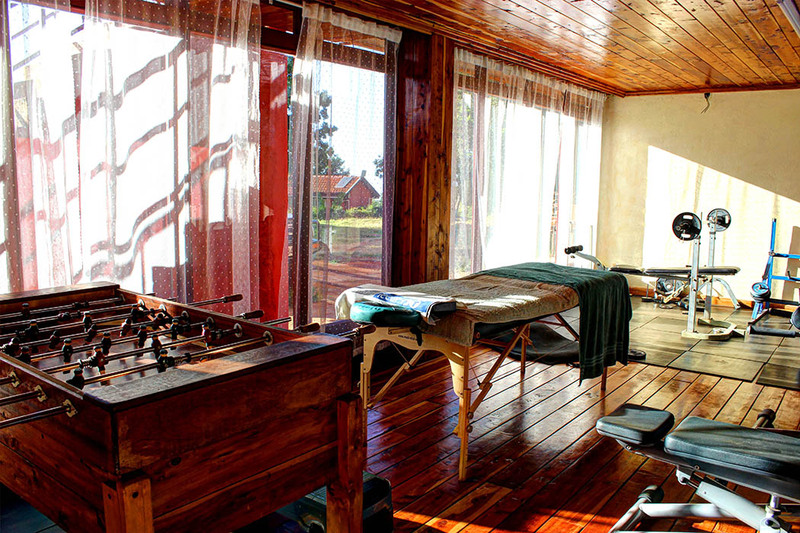 Iten town is notable as the training ground of Kenya’s famous athletes, and is also a popular destination for athletes from all over the world who are attracted to it’s high altitude. 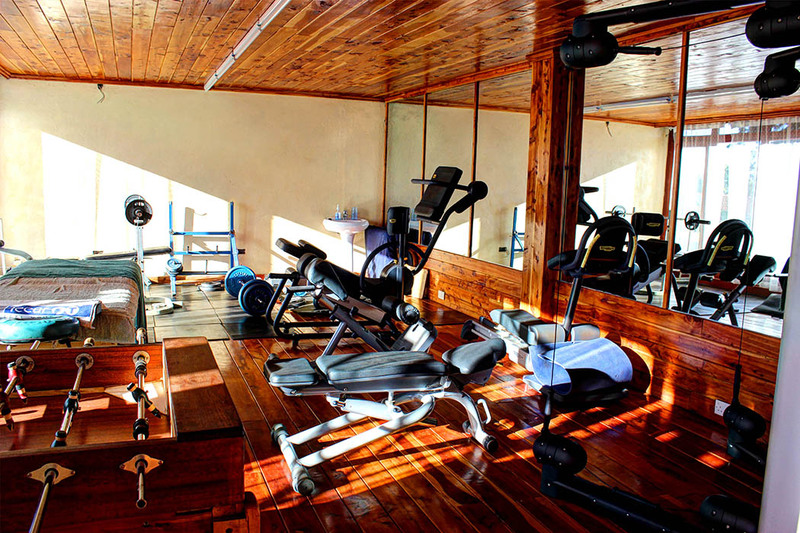 Some of the athletes stay at Kerio View and to cater for them there is a very well equipped gym. I had no time to work out (I never do anyway) so all I used was the weighing scale. Despite not spending much time at the hotel I did enjoy my stay. 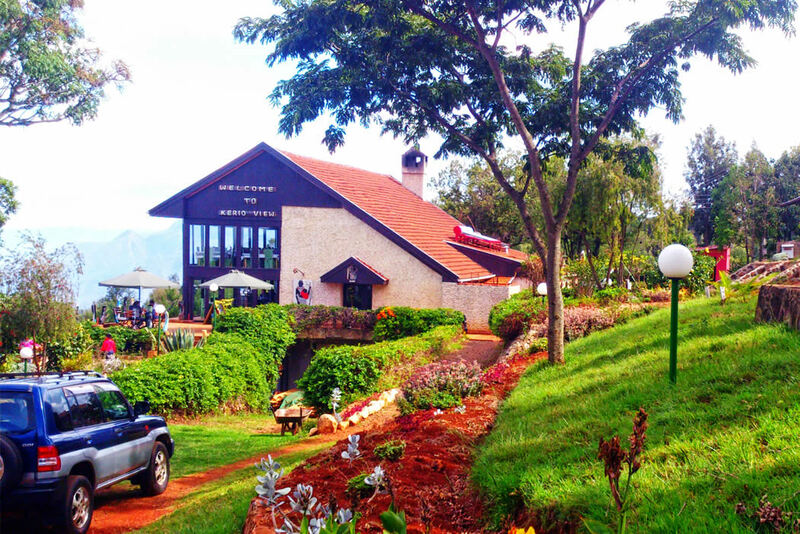 If you’re planning on staying in Iten I would definitely recommend it and if you’re simply passing by you can stop by the restaurant for a meal. 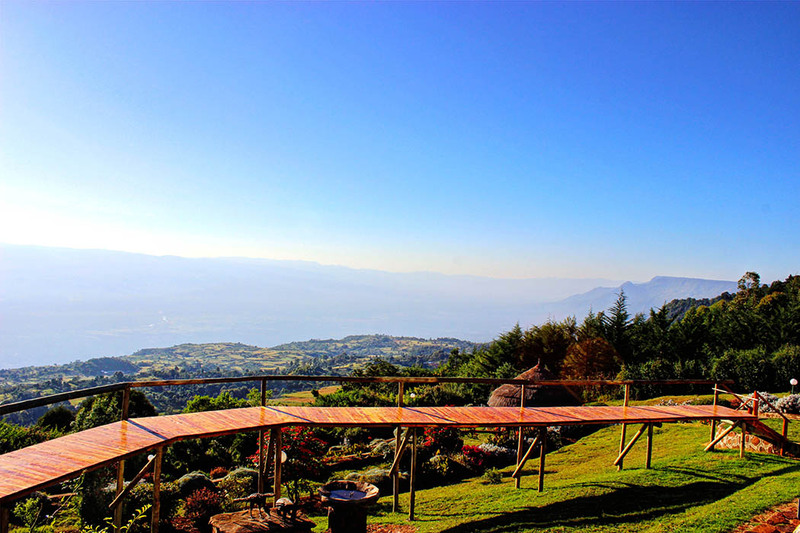 Other activities include hiking, paragliding, bird watching, biking and training with or watching the country’s famous long distance runners. 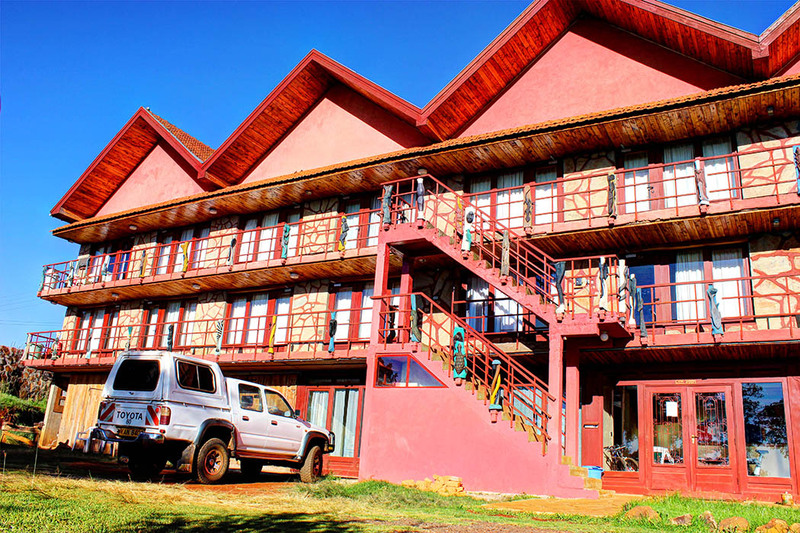 What do you think of Kerio View Hotel ? 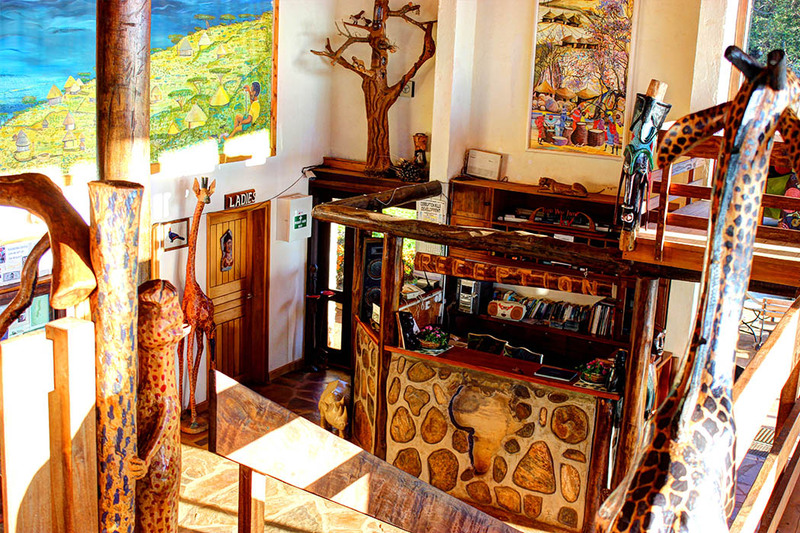 Is it a place that you would add to your itinerary? Rachel, What a lovely place to stay. I would love a sunrise stroll along the boardwalk. Thanks again for linking up with Weekend Travel Inspiration. 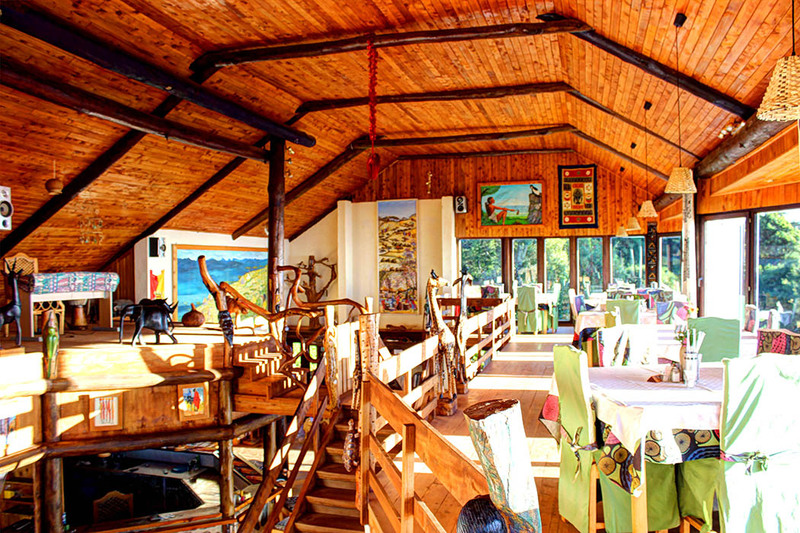 How rustic and beautiful, especially the views. That salad looks heavenly and mouthwatering . Too bad about the ribs and lasagna. 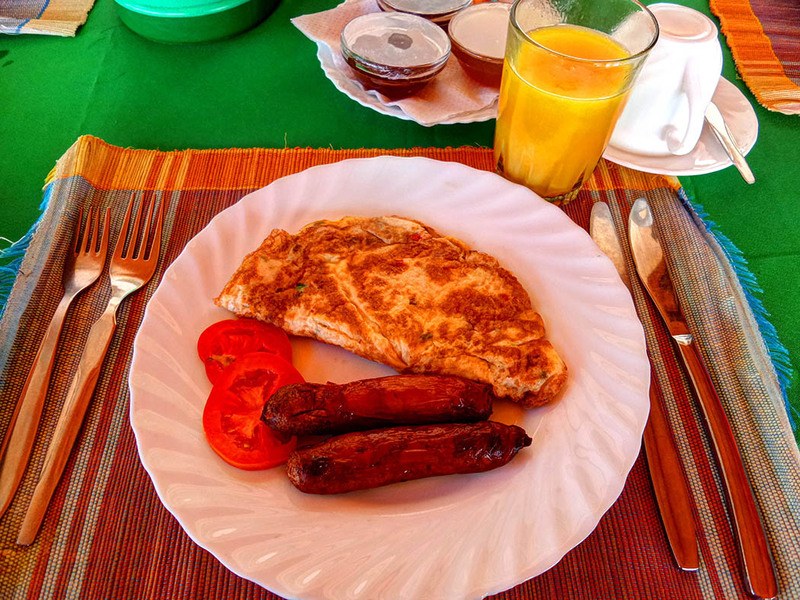 Is plantain available in Kenya? 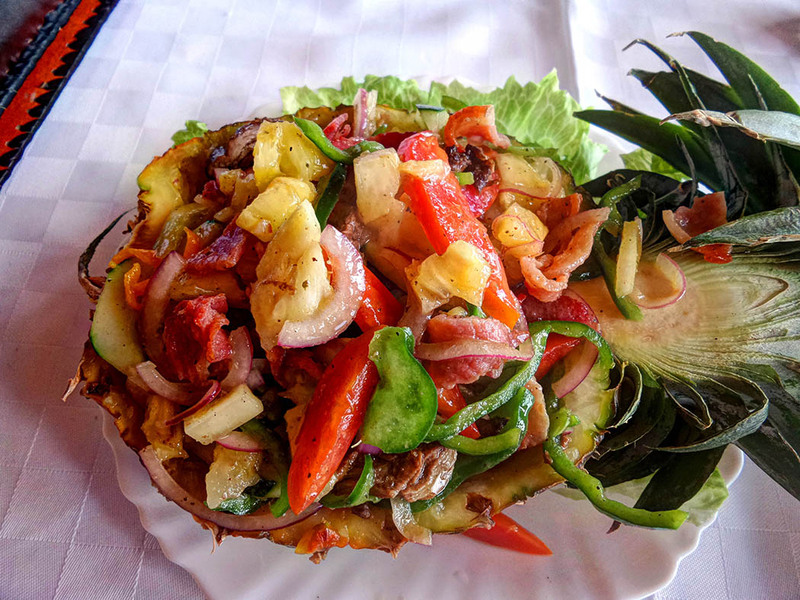 It is but it is not very common.What we do have is green bananas (also known as matoke) and we make this with potatoes. I have actually been looking for some as I really miss fried plantain. This looks like such a nice, peaceful place to stay. The sunrise from the boardwalk is amazing! Too bad your dinners weren’t that good though. It is very peaceful. I was wishing we could stay longer but we had to go on with our journey. It’s a mixture of haze and smoke (from burning charcoal). I had no idea why the meals took so long, there weren’t many guests at the hotel. I do agree with you, we would definitely get along when it comes to food. 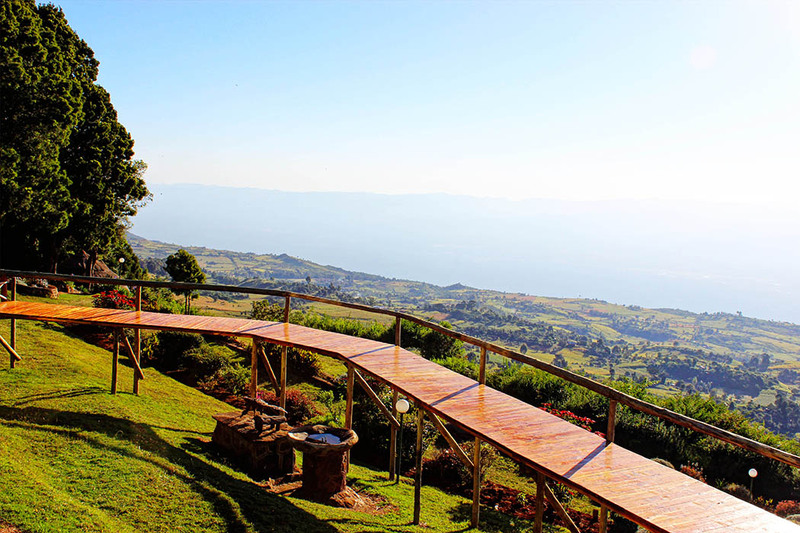 Kerio view is a great location! 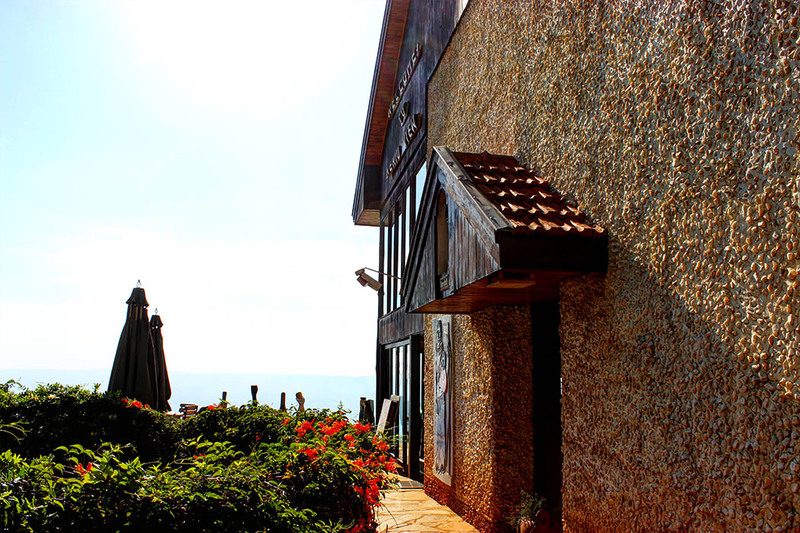 The view is absolutely stunning and the restaurant is also really nicely decorated with a wonderful big fire for chilly evenings. Went on a hike down the escarpment was given directions by the hotel staff. I hear they also offer paragliding. The rooms are ok with more great views. Overall a wonderful place which I will visit again! I would definitely love to go back too. The paragliding is on my bucket list. 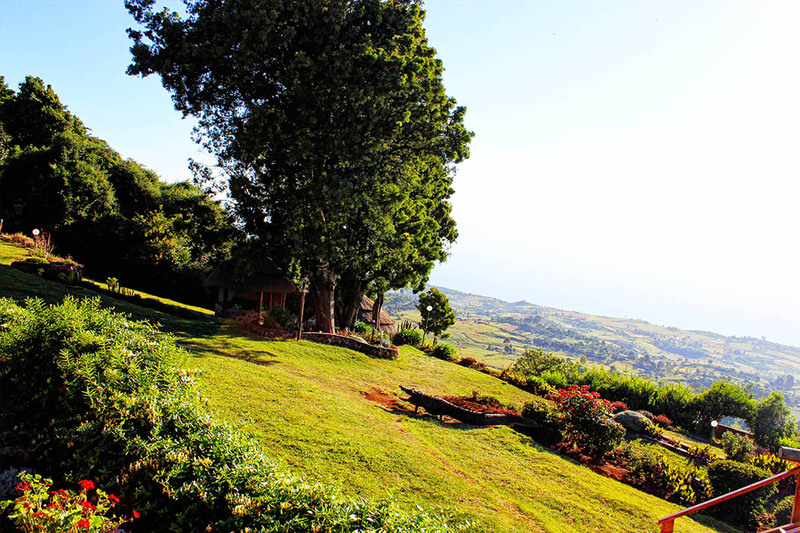 Kerio View looks beautiful and serene. That sunrise is majestic. What a lovely place! I really like that boardwalk. Looks like a lovely place to stay. That view is stunning. This place is absolutely amazing! After seeing your pictures I feel like packing my little backpack and going there! Definitely adding it to my bucket list. How about the food there? How did you enjoy it? Hi Lea, we visited towards the end of October. The mornings were definitely chilly but during the day the weather was lovely. The view is amazing…but I hope they have now worked on their rooms, they dont look very nice.